Best of education wordpress themes that are responsive, free and premium. These WordPress education themes are suitable for schools, universities and college websites. We recently got a project to provide best education WordPress themes for School, University, College websites. We did had to make sure that wordpress themes have to be clean, modern and well developed. As you all know how time consuming this whole process is!. There are themes that have great design but poor admin panel where user cant do much to customize the site. So went further one step and found best suitable wordpress education themes that are well designed and have powerful theme option panels and nevertheless takes full advantage of latest and greatest page builder. These responsive education WordPress themes are ideal for Educational suitable for School, College, Kindergartens, Elementary, Primary Schools, Secondary Schools, Universities, Academics and Educational. Where you can customize them to your needs. We hope you will like our effort and if there is anything we missed you will give us suggestion for addition. The greatest challenge was to build a theme that is easy to use for non-experienced WordPress users but still powerful enough to fulfill its purpose. I believe that Buntington overcomes all of your expectations! It has a Visual Home Page Builder, Events, Courses (with powerful search included), Sliders builder, Galleries, reusable content library – Content Chunks, a bunch of handy shortcodes, widgets and a damn easy to understand theme Options. If you or your clients long for a powerful management system which is both lightweight and user-friendly Buntington might be a great choice! Lincoln is our best education WordPress theme release using material design for Education & Learning Centers which will surely amaze you with many powerful features. Though it is perfect for education industry, yet it’s still flexible enough to be used for business website and creative digital agencies. To fine tune Lincoln, we have done a deep research within the industry. So we know exactly which features your Learning business should have on the website. You can easily create courses with categories and split into the classes, get reviews, set the prices, discounts, create events, assign teacher/speaker and even post on the blog with different layouts. 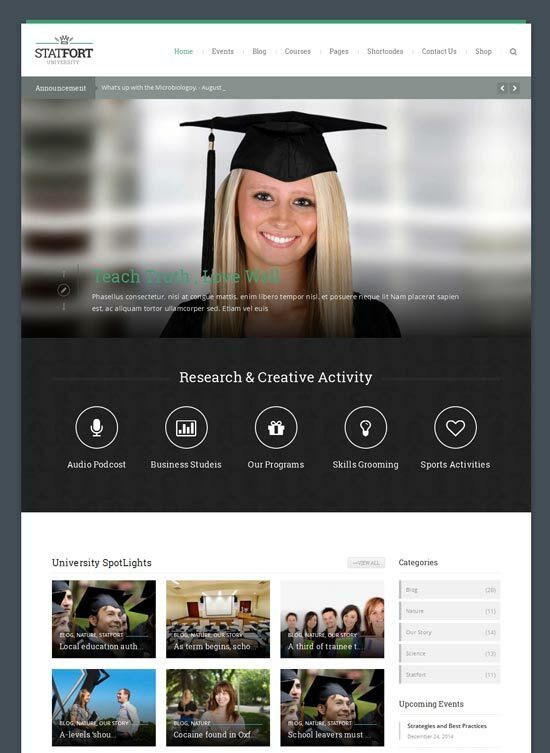 UOCE (University of College Education) is elegant, customizable, easy, and clear education WordPress theme. UOCE theme provides stunning features for creating Online Courses, Teams, Events, Galleries and many more for your institute. The theme is a complete courses management system where you can create online courses such as, Courses Schedule, Descriptions, Pricing Options and Courses Features. It is the easiest theme to set look & feel as per your choice. Another astonishing feature is SEO compatibility. Theme is fully compatible with the latest SEO techniques. UOCE theme is flexible and have bundle of theme customization options to style your site as per your desire. Also, it can be translated in any language of your choice through WPML plugin. 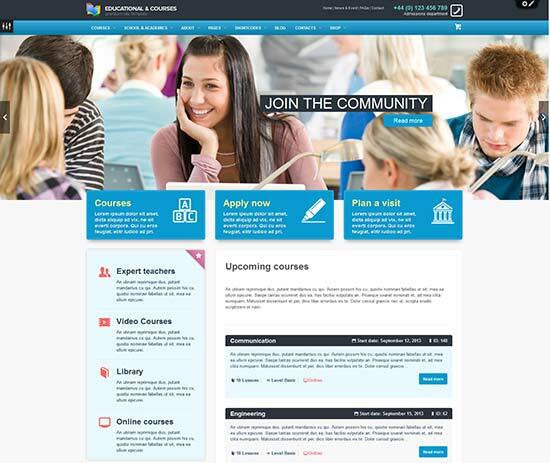 Edubase is fully responsive education wordpress theme and retina ready. Therefore, you will feel ease to look so nice on all electronics devices, be in phones or tablets it will adapt to screen size and be awesome on retina screens. Theme can be easily modified to your needs and unique style. You get tons of layout possibilities and unlimited variations and colors. Ethic is a purpose built education WordPress theme that will be a suitable choice for educational establishments like colleges and schools, as well as trainings and courses. Coming out with powerful admin panel and outstanding features, Ethic will be your right tool to run a clean, smart and professional website. MasterStudy is the best education WordPress theme for the Education & Learning Center – for educational organizations, who sell courses and organize classes locally. Using Masterstudy you can easily setup a stunnig WordPress site for your education business. University is a multipurpose education WordPress theme for Events, Courses, Online Learning System, Business and Shopping. Please rate 11111 if you like the theme and leave comments so we can make better products. ParkCollege is a education WordPress theme designed with learning institutions/educational websites in mind. We wanna to present you a professional and awesome high quality education theme for kinder gardens, day care, preschool and it would suit for any children, art, craft, school. Phoenix is a clean education WordPress theme with elegant look and feel. Its clean layout draws users’ attention to important details like educational programs, student’s info, etc. A large hero image features several bold banners with cool hover effect. To save on space and add a more balanced look to the layout, content was organized in a grid-based list. The theme is highly customizable, with several custom page templates. Its fully responsive layout will look perfect on any screen size. To make your website easily accessible for everyone around the world, the template was made crossbrowser compatible and SEO-friendly. KIDIX is a responsive education WordPress theme best suitable for kindergarten, school, education, child care center, preschool or nursery related websites. KINDERGARTEN WordPress theme, is a purpose built theme that will deliver an easy to use kindergarten, child care or nursery wordpress website. Packed with every premium wordpress plugin you will ever need and prebuilt pages that are optimised for the childcare and nursery industry, you will have your new website up and running in no time at all. Driveme is a clean education WordPress theme suitable for Driving School or any learning institute. CUPID is a stylish education WordPress theme for kindergarten’s school or any similar local business website. It is very easy to setup and use. Varsita is a multipurpose education WordPress theme for all kinds of high schools, universities, courses, Online Learning System, and education business. It’s beautiful, clean, modern and professional. We built this theme specifically for educational institutions, training organizations and include easy to use customization features. We build something awesome that helps schools, faculty members, and students. Milagro – Learning and Courses WordPress Theme – is a good solutions for your business. This is a perfect wordpress theme for Leaning portals, for courses agencies, for e-learning sites or shops. PeachClub is a responsive and clean education WordPress theme best suitable for kindergarten, child care center, preschool or nursery, school, child school, daycares, preschools and other small businesses like children, art, craft or creative website. Baby Kids education is a multi-page and Multipurpose education WordPress theme suitable for School, College, Kindergartens, Elementary, Primary Schools, Secondary Schools, Universities, Academics and Educational. This advanced University WordPress Theme is meant for effective promotion of any educational institution on the web. With its help, you can ensure usability for visitors of your site by means of a dropdown menu, back to top button, and clean content area. Red is chosen for the tone of a wide screen header image, logo, menu items, and some typography to make this design feel more motivational. This education WordPress theme looks like the perfect fit for university, college or online training school. There is enough space for displaying each course and its short description in this fully responsive design. The template is SEO optimized, which makes your site easy to find in search engines. Edulms is a stylish, customizable, simple, and readable education WordPress theme. Make it yours with a custom menu and custom theme options. Edulms theme provides easiest platform you will ever see to create an unlimited number of Courses, Lessons, and Lesson Topics. Happy Child is the outstanding WordPress education theme created for professional child care centres and kindergartens. The responsive layout is designed based on the Bootstrap 3.1 grid standards. WPLMS is a education wordpress theme for Learning Management System. It is an e-learning WordPress theme for course management, instructor and student management using which you can create and sell your courses online. Statfort is a modern education WordPress theme specially designed for colleges, universities and educational websites. This theme is easy to modify and Ready to be up and running out of the box. Carry Hill School is a beautifully designed WordPress education Theme for your child school, child care, but it would suit any children, art, craft or creative website. It comes with Drag and Drop Page Builder which enables you to create your page content with ease. Kids Zone is a beautifully designed WordPress Theme for kinder gardens, Day care, preschool and it would suit for any children, art, craft, school & Training Website. My College is education theme and design for responsive your large desktop screen, all the way down to your iPhone – and of course any Tablet or iPad. King Power is a super premium multi-purpose school WordPress theme. It’s clean, responsive with retina ready design. You can also switch the content layout to Boxed/Full style easily via admin panel but not only the content layout, you can also choose Boxed/Full style for slider layout separately from content area too. This theme also supports theme customize which allow you to change theme element’s color in the front end. More over, admin panel and page builder in this theme is the best one. Campus is the best new theme for education and business. We Based on our new Super Skeleton 2 Framework; Over 6 months in the making, we’ve re-coded our entire “Super Skeleton” framework from the ground up to leverage the best, cleanest, fastest features that WordPress has to offer. Kindergarten is a Bootstrap 3 based responsive Retina-Ready WordPress theme, designed for kindergartens/nursery/preschool, or any other kids-themed websites. 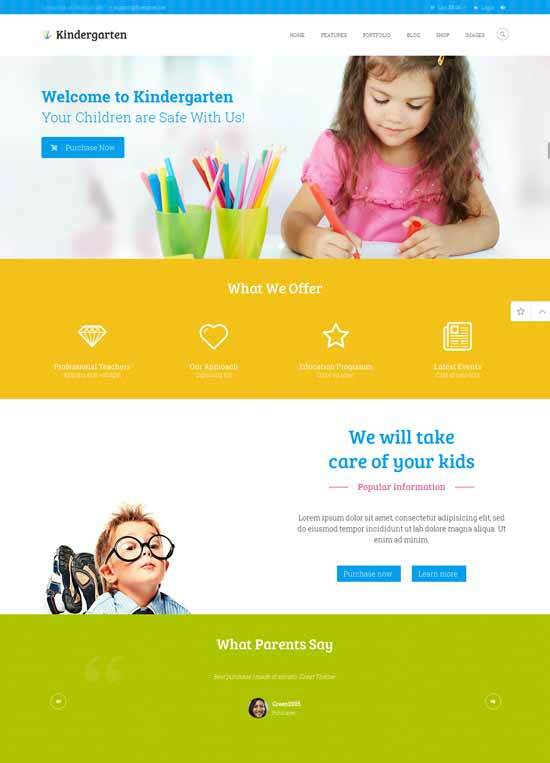 Happy Kids is a simple and clean, but still professional children WordPress education Theme. It is designed towards kindergartens, daycares, preschools and other small businesses. It’s created by using the latest HTML5 and CSS3 technologies. This education services WordPress theme makes an impression of serious and professional enterprise, where people know what they are doing and for which purpose. Lots of smiling teachers’ and tutors’ portraits help the visitors set initial contact with the person they are going to hire. Transparent text blocks impart template a trendy look. Philosophy knowledge is of high value since it encourages critical thinking and inductive reasoning. For that reason, such courses enjoy wide popularity in the sphere of education. If you want to help philosophy schools attract more learners, make use of this theme. Looking at the picture of a thoughtful philosopher, people will believe in the ability to broaden their outlook and learn to think outside the box at the promoted institution. Modern applicants get a general impression about educational institutions judging by their online presence. Thats why universities have to take care of their websites thoroughly to boost their student base. If you want to help them in this issue, the featured template will be beneficial for your initiative. It’ll give schools an opportunity to demonstrate that in students’ life there isn’t only endless cramming. This template has a flat design, which makes a plenty of colors, used here, look harmonically. The theme carries all the default goodies of modern progressive websites, and, moreover, it’s improved with Cherry Framework. The prevailing white background slightly diluted with strict colors grows the atmosphere of solidness, which is so indispensable for a serious educational website. The revolutionary Bootstrap-based Cherry Framework will allocate your resource among other uniform ones, recruiting more young people to get into your university. Kid’s Voice School is a beautifully designed WordPress education Theme for your child school, child care, but it would suit for any children, art, craft or creative website. Educate free WordPress education theme developed mainly for schools, colleges, training institutes etc in mind. It is a mobile responsive theme which means it is optimized for all the mobile devices, desktops etc. It is SEO friendly as well. It comes with Theme Options to ensure it is super easy to customize as per your needs. University free is a responsive premium WordPress theme that can be used for different types of institutions and organizations. In the front page there is a slider where you can feature as many pages or posts as you want. Below that another section with featured pages and posts. Academica is a simple blogging education theme, perfect for non-profit and education sites. Includes a layout with 3 columns, custom page templates, and can be customized easily. It’s also fully responsive & retina-ready. 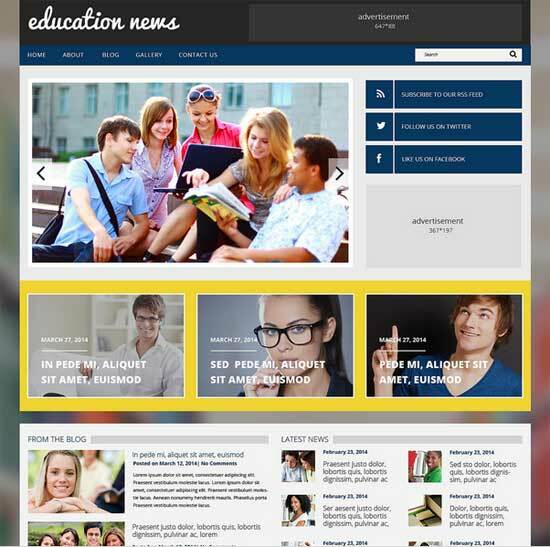 College is a responsive and free education WordPress theme for universities that want to have an online presentation. 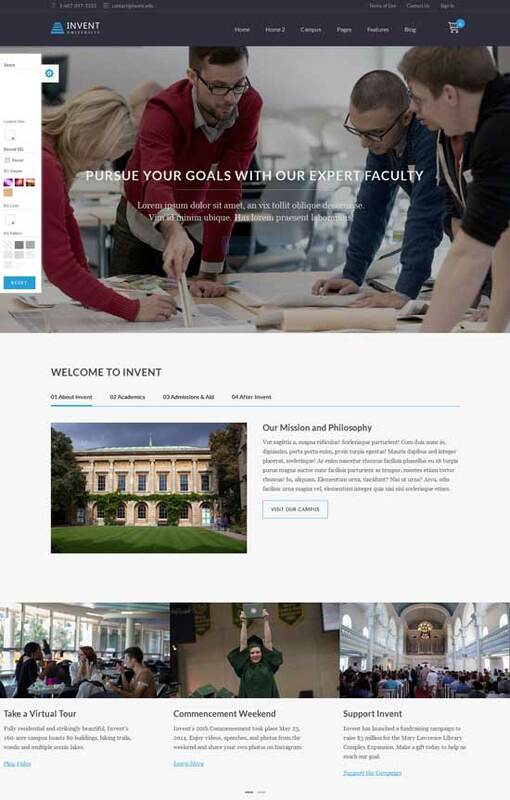 Some of the features that the College theme includes are multiple columns, recommended shortcodes, responsive layout (built on top of Twitter Bootstrap boilerplate), full width pages, pages with sidebars and more.